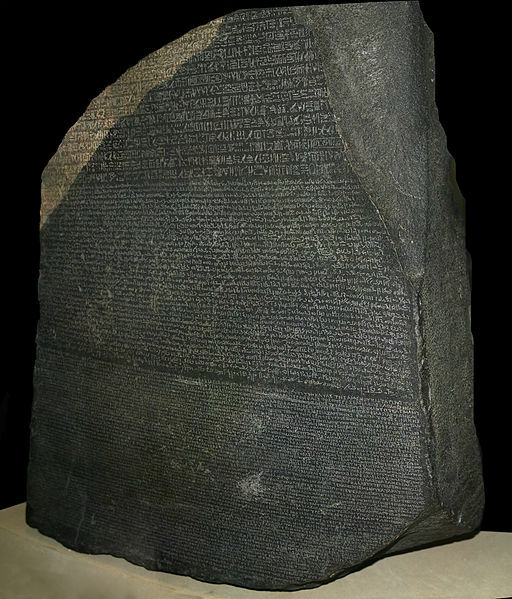 The Rosetta Stone is an ancient Egyptian stone stele inscribed with a decree issued at Memphis in 196 BC on behalf of King Ptolemy V (see bust). Originally displayed within a temple, the stele was probably moved during the early Christian or medieval period and eventually used as building material in the construction of Fort Julien near the town of Rashid (Rosetta) in the Nile Delta. 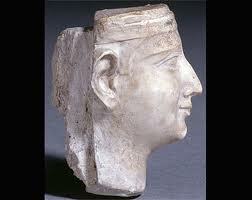 It was rediscovered there in 1799 by a soldier in the French expedition to Egypt. In 1801 when British troops defeated the French in Egypt, the original stone came into British possession. The Rosetta Stone was transported to London and has been on public display at the British Museum since 1802. As the first Ancient Egyptian multi-lingual text recovered in modern times, the Rosetta Stone attracted a lot of attention because it could be used to decipher the untranslated ancient Egyptian language. The decree appears in three scripts: the upper text is Ancient Egyptian hieroglyphs, the middle portion Demotic script, and the lowest Ancient Greek. Casts and copies of the text were disseminated widely among European museums and scholars. Comparing the Ancient Greek translation to the unknown Egyptian language provided the key to the modern understanding of Egyptian hieroglyphs. The translation was completed by Jean -Francois Champollion in 1824. While other multi-lingual texts have been discovered since, the Rosetta Stone was the essential key to modern understanding of Ancient Egyptian literature and civilization. It is the most-visited object in the British Museum. Doubtful that Britain will turn it over to France or Egypt.